We slept in a bit, well almost until nine and then I got up and walked Mix along the tow path, back towards the Rolls Royce works and then back to the boat for breakfast – a roll and cheese. I packed up all my bits and pieces and sorted out my drawer, my cupboard over my side of the bunk and the hanging cupboard and then I took the toilet cassette along to the marina hygiene station to empty it and clean. 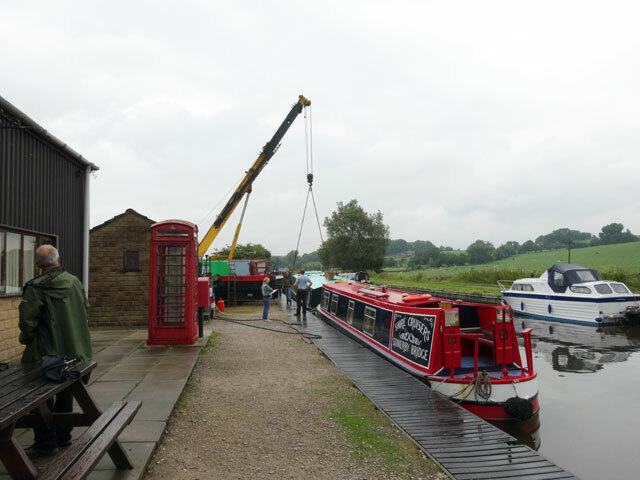 While there I saw that there were a number of boats being lifted out today – I imagine so that they can have their bottoms blacked and the hulls repainted. That’s something which we will have to do quite soon. I wandered back to the boat and reinstalled the toilet cassette before taking the other cassette back to the hygiene station to clean it out as well. I always like us to arrive at the boat with everything in order for the next cruise. Meanwhile Rachel had done some cleaning – not as much as she had intended because it was wet today and it was not a good day for doing things outside. So we contented ourselves with taking the dogs for a short walk ending up at the Marina where we loaded them into the car, drove to the boat, loaded up the car and set off for home. Normally the Tom-Tom tells us that the journey will take four hours and six minutes and we get home in about three and a half hours. Today it took nearer to five hours as we ran into road works on the A1 and then into the rush hour at Newcastle. As a result it was almost seven when we arrived back at Mount Pleasant. Just in time for supper. We ate with Mum, Olive and Digger enjoying their news that Mum’s house sale had been completed at ten minutes to five that afternoon. Back home in the Granary we unpacked, watched an old Inspector Gently on television, walked the dogs and went to bed. It was good to be home in our beds after an exciting week.